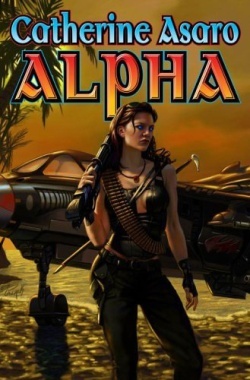 I have a new post up at Heroes and Heartbreakers: Androids Have Delicious Despair Moments, Too: Alpha by Catherine Asaro. The focus is on a pivotal moment in the book that yields delicious despair for the reader. I invite you to share it with me; however, if you haven't read ALPHA, but plan to, then please be aware that there are some spoilers. I didn't give away the ending or anything, but I did describe a key scene. If you have read it, then I hope you'll have fun re-experiencing that moment! I knew I'd have to re-read ALPHA to research it for this post. Frankly, I had such a thrilling experience the first time that I was a bit worried the story wouldn't be as good the second time around. Fortunately, the opposite was true. I enjoyed the book as much as--if not more than--the first time I read it. I recommend ALPHA if you're a fan of anti-heroines, androids, May-December romances, seasoned military heroes, fighter jets, nanotechnology, cyberpunk elements, high-tech weapons, and near-future suspense stories. It's all in there!